Always attention to detail, technical skills, passion in our work and great attention to customer needs are the strengths that have allowed us to excel in the field of sale of Airbrush Paasche RAPTOR RG-3S SET 3 heads size 0.25 0.38 0.66 mm. 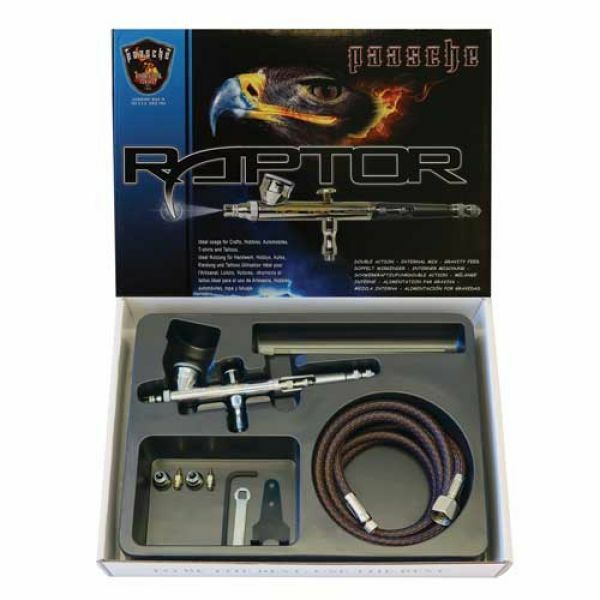 Consultando il catalogo di Aerografando you will immediately notice how vast it is and how diversified the model range is Paasche, you will find the best Airbrush Paasche RAPTOR RG-3S SET 3 heads size 0.25 0.38 0.66 mm offers at the best prices on all Airbrush Paasche RAPTOR RG-3S SET 3 heads size 0.25 0.38 0.66 mm of the brands Paasche. The Raptor RG-3S is Double Action Internal Mix Gravity Feed Airbrush Set. The airbrush features a chrome plated body and anodized aluminum handle for durability. Included with the airbrush are all three available spray heads, which allow the RG to be used for a wide range of airbrushing applications. The paint reservoir is smaller than the Talon series to allow an unobstructed view of the painting surface. The RG is a fine detail airbrush allowing the user to achieve hair line detail or patterns up to 1 inch. The handle includes a needle stop to assist with consistent paint release and a PTFE packing allows the RG to handle any water or solvent based paint or thinner. Clean up is as simple as spraying your paint cleaner though the airbrush and wiping of the needle. Applications including automotive graphics, models, taxidermy, cake decorating, tattoos, finger nails, graphic arts, illustration, etc. 1.8 m braided hose; compressor side connection from 1/4"
Head sizes included are 0.25 mm, 0.38mm, 0.66 mm. Read the reviews of our customers on Airbrush Paasche RAPTOR RG-3S SET 3 heads size 0.25 0.38 0.66 mm of the category Paasche. Review Airbrush Paasche RAPTOR RG-3S SET 3 heads size 0.25 0.38 0.66 mm of the brand Paasche. Trust in the quality and professionalism of Aerografando on the sale of Airbrush Paasche RAPTOR RG-3S SET 3 heads size 0.25 0.38 0.66 mm, only from us you will find the best prices. You want to have more details on Airbrush Paasche RAPTOR RG-3S SET 3 heads size 0.25 0.38 0.66 mm RG3S or more generally on ours Paasche? You are looking for a Paasche but do not you find it in the catalog? Staff of Aerografando will answer all your requests.